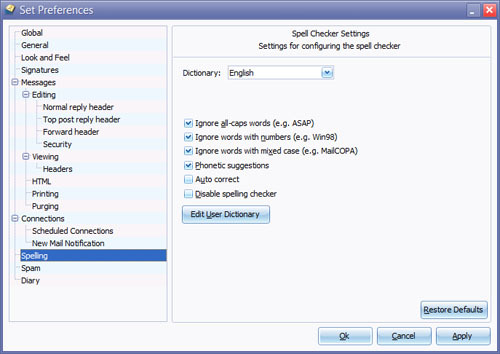 Currently there is no facility to do a spell check on a completed message: spellchecking is done automatically as you type. When enabled, words will be automatically underlined in red. Right-clicking on a word produces a context menu with suggestions of the correct spelling of what might be the intended word. Email addresses (ie words that include an at sign - @) will not be spell-checked. If autocorrection is enabled, misspellings contained in the built-in list will be automatically corrected, without user intervention - it will also be impossible to enter such misspellings without their being auto-corrected !